Dr. Byrd received his bachelor’s degree from the United States Military Academy at West Point, New York, in 2000. He served as a cavalry officer in the Second Armored Cavalry Regiment at Fort Polk, Louisiana, from 2000-05 and was awarded for valor for his service in Operation Iraqi Freedom in 2003-04. While serving as an officer in the Mississippi Army National Guard in Jackson, he earned his M.D. at UMMC in 2011. He then began his combined residency training in Internal Medicine and Dermatology in Minneapolis while serving as a major in the Medical Corps Branch of the Minnesota Army National Guard in Cottage Grove. 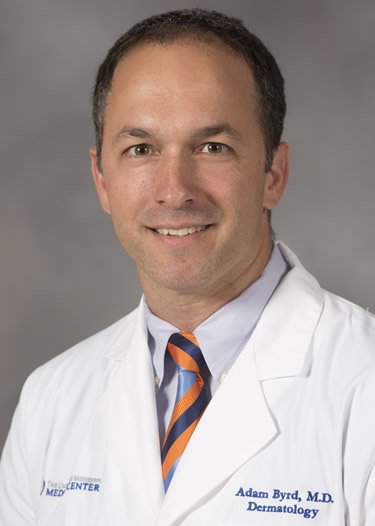 Upon graduation from his residency in 2016, Dr. Byrd was elected by the dermatology faculty at Minnesota to receive the Rob Sias Award for Clinical Excellence, given annually to the graduating resident to whom faculty would most readily refer their family for dermatologic care. He also is the recipient of various military awards, including Army Commendation Medals and Army Achievement Awards. Dr. Byrd continues to serve as a field surgeon in the Mississippi Army National Guard and returned from a deployment in Kuwait in December 2018. Dr Byrd returned to Mississippi as the first full-time academic rural dermatologist on the faculty of the University of Mississippi. He lives and works in his home town of Louisville, a town with 6,400 residents with his wife Elisabeth and three children. Adam prides himself in being the kind of dermatologist who can do “everything” required to meet the needs of his community. Outside work, he enjoys hunting, fishing, hiking, and reading romance novels.